10 Children's Room Wall Decals Under $10! You are here: Home / Great Deals / Amazon Deals / 10 Children’s Room Wall Decals Under $10! 10 Children’s Room Wall Decals Under $10! Vinyl wall decals are one of my favorite ways to decorate because they’re so cute and SO frugal and economical! And, there are SO many adorable ones for children’s rooms! 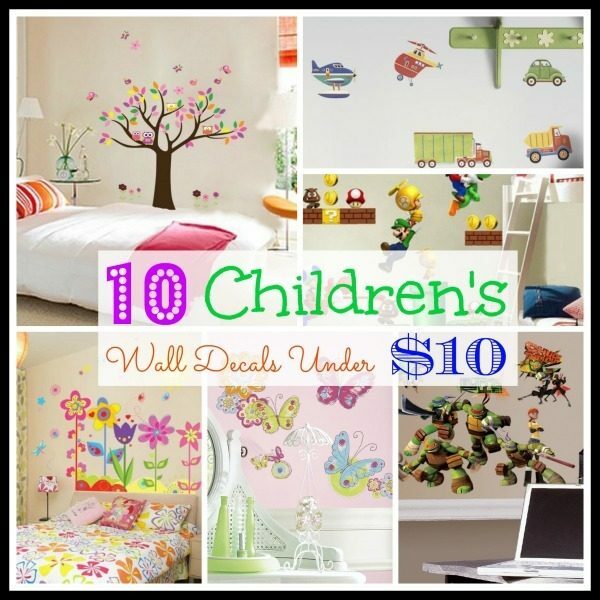 So, if you have a child and are looking for some new decor, we have a list of 10 Children’s Room Wall Decals under $10 for you! I Love You to the Moon and Back Wall Decal – $2.93 + FREE shipping! Super Mario Bros Kids Wall Decals – $4.25 + FREE shipping! Colorful Flowers, Butterfly, Owls, Birds and Tree Wall Decal – $5.53 + FREE shipping! Large Amazing Super Spider-man Wall Decal – $5.57 + FREE shipping! Transportation Peel & Stick Wall Decals – $6.73 + FREE shipping! Large Flowers Wall Decal – $8.99 + FREE shipping! Jungle Adventure Peel & Stick Wall Decals – $9.97 + FREE shipping! Disney Princess Peel & Stick Wall Decals – $9.97 + FREE shipping! Brushwork Butterfly Peel and Stick Wall Decals – $9.97 + FREE shipping! Teenage Mutant Ninja Turtles Peel And Stick Wall Decals – $9.99 + FREE shipping!